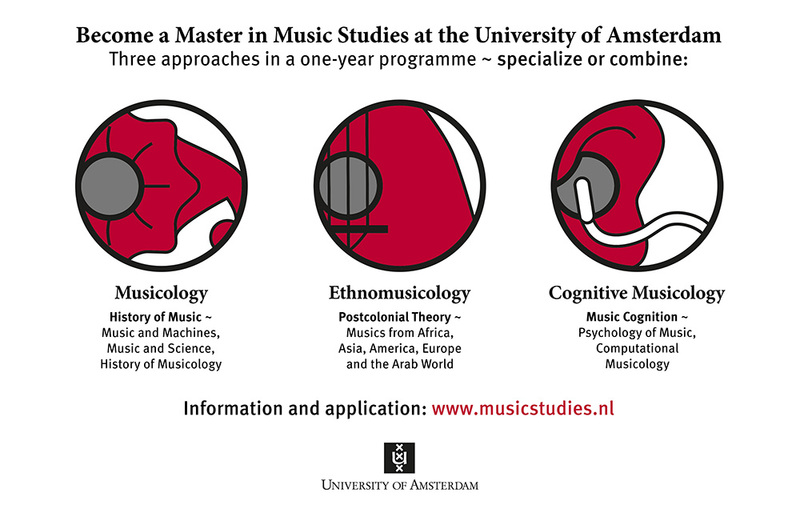 The 2015 promotional flyer for the MA programme in Music Studies at the University of Amsterdam has revived the debate on the disciplinary identities among the Department of Musicology. The basic idea of the new MA programme – which, I should add, I fully support – is that under the general rubric of ‘music studies’ the students in Amsterdam are offered a wide variety of musicological topics and approaches, from which they can freely select one or (preferably) several specialisations. From September 2015, ‘Music Studies’ will even replace ‘Musicology’ as the formal title of the study programme, therewith embracing Laudan Nooshin’s proposition to dispense with the problematic disciplinary labels of ‘(Ethno)Musicology’ (Nooshin 2008). In the recent debates at the University of Amsterdam, however, relatively little attention has been granted to this formality. Instead, the controversies have concentrated on how the programme is being promoted, and specifically on how the different fields of specialisation are represented on the flyer – which is where, notably, (Ethno)Musicology reappears. The most outspoken response to these developments comes from Wim van der Meer, formerly Associate Professor in Cultural Musicology at the UvA and, in that function, coordinator of the BA and MA study programmes at the Department of Musicology. Van der Meer has long disdained the disciplinary binary of ethno/musicology, as it segregates the musics of world between the West and the Rest. Alternatively, he advocates cultural musicology as an all-embracing field of study, which resonates with many of his colleagues and students (his response can be read here). I fully recognise the necessity of debating the disciplinary terminology that is being used, both in Amsterdam and internationally, as it not only reflects but also institutionalises a lingering colonial bias. However, I argue that the concise descriptions of the contents of the specialisations, as these are represented on the promotional flyer, similarly rely on problematic biases, and thus equally require critical reflection. To join the debates, and with the intention to impel further discussion, I briefly outline two of my concerns with these descriptions, after which I will try to illustrate the urgency of these issues by resorting to a quote by Edward Said that is representative of an enduring colonial bias in contemporary universalist claims of ‘music history’ . My first concern relates to the methodological signposts that the promotional flyer attributes to the different specialisations . What has been labelled as ‘Ethnomusicology’ is, significantly, identified as a field of musicological inquiry that embraces ‘Postcolonial Theory’. Considering that this field, etymologically speaking, studies the music of ‘the Other’, a thorough methodological grounding in postcolonial theory is indeed highly urgent, and it can only be commended that, as emphasised on the promotional flyer, this perspective occupies a prominent position within ethnomusicology. In the description of ‘Musicology’ as the ‘History of Music’, by contrast, postcolonial theory is absent; as if from a historical perspective the question of colonialism is irrelevant. Obviously, such a concise abstract of the contents cannot contain a comprehensive overview of all the questions that are dealt with, and colonialism might very well be a central issue in the historical courses of the study programme. Nevertheless, to prominently highlight postcolonial theory as a (or the) central perspective within ethnomusicology, but excluding it from musicology, implies an imbalanced relation between the material that is being discussed and the theoretical perspectives through which this is done. Second, on the promotional flyer ethnomusicology is further specified as studying the ‘Musics from Africa, Asia, America, Europe and the Arab World’; that is, despite the (almost) all-encompassing designation, it is studying local musics. By contrast, musicology is – it goes without saying – primarily concerned with ‘Western’ ‘classical’ music, which presumably does not require any geographical specification . To refrain from specifying the locality, and thus implicitly assuming Europe to be the universal subject of historical musicology, restates the colonial binary of the people with and without history. This binary has for several decades been under close scrutiny within postcolonial studies (e.g. Young 1990 and Chakrabarty 2000); and yet, music history, to the extent that it ignores these writings in postcolonial theory, continues to make universalist claims on ‘history’ as an exclusively European phenomenon. With this disregard for postcolonial theory, and by implicitly assuming history to be Western, the exclusivist form in which music history is taught – or at least, in which it is being represented on this flyer – continues to rely on colonial prejudice. To illustrate the persistence of these universalist claims on ‘history’, and to elucidate how these claims are particularly enduring in relation to music, I will resort to a brief discussion on the approach to music by Edward Said. Although Said has gained his most widespread influence with Orientalism (1978), in which he analyses the historical ties between the academic field of orientalism and the colonial and imperial power relations in the Middle East, he has also published extensively on music. These publications include the books Musical Elaborations (1991), Parallels and Paradoxes, co-authored with Daniel Barenboim (2002), and the posthumously published On Late Style (2006) and Music at the Limits (2008). Considering Said’s influential critique in postcolonial studies, it is remarkable that, when writing or speaking about music, he appears to be extremely Eurocentric. Not only does he almost exclusively reserve his reflections on music to ‘Western classical music’, but on the rare occasions that he opens his ears to a different repertoire – and in particular, when discussing what seems to be a minor childhood trauma related to the Egyptian singer Umm Kulthum – he relies on the same orientalist stereotypes that he so eloquently criticises in other contexts . However, it is not only in relation to other repertoires that Said demonstrates himself to be relying on nineteenth-century colonial prejudices, but also when he discusses ‘Western classical music’. More specifically, Said often strongly relies on problematic universalist claims when discussing this specific repertoire. One occasion where these universalist claims become particularly explicit is in a radio interview from December 2002. In this interview, conducted by Scott Simon for the radio station NPR, Said is questioned together with the conductor and pianist Daniel Barenboim, with whom he had recently published the book Parallels and Paradoxes: Explorations in Music and Society (2002). A notable statement occurs when Simon asks Said and Barenboim to reflect on what Beethoven, who occupies a prominent position in their book, means to them. To this question, Said replies: . In this passage, and particularly with the claim that Beethoven ‘really transcends the time and place of which he was a part’, Said strongly relies on nineteenth-century Austro-Germanic ideals of absolute music (see e.g. Dahlhaus 1989). But despite the obvious historical and geographical specificity, Beethoven supposedly ‘speaks to anyone who likes music’, a statement with which Said practically equates ‘Beethoven’ and ‘music’. Said continues by declaring that this music is ‘expressing the highest human ideals’ – can this be opposed to other musics expressing ‘the lowest human ideals’? – and by making these ideals into ‘universal experiences’. Especially Said’s proposition, that the cause for all of this is that ‘Beethoven’ is wordless, directly refers to the familiar the ideals of the purity of ‘absolute’ instrumental music – which, again, is implicitly opposed to allegedly ‘lower’ forms of vocal music. With the claim of ‘Beethoven’ being transcendental and universal, Said touches upon nineteenth- and early twentieth-century ideas of cultural superiority, which closely relate to the contemporary discourses of racism, nationalism, colonialism and imperialism. Of all people, we would expect Said to be aware of these relations. In the books Orientalism (1978) and Culture and Imperialism (1993), among other writings, Said offers a thorough critique of the mutual influences between academic knowledge and cultural artefacts on the one hand and colonial discourses on the other; but when it comes to music, he appears to have a blind spot – or rather a deaf ear – for these relations. In the absence of (his own) writings in postcolonial theory, ‘Beethoven’ – or more generally early nineteenth-century Austro-Germanic instrumental music – is equated with ‘music’, and studying this repertoire is thus considered a universal ‘music history’. This ‘music’, however, is obviously a highly specific repertoire, which is not only limited historically and geographically to nineteenth-century European/Austro-Germanic composers, but it is also restricted to the urban elite societies of these times and places – and, moreover, carefully selected to serve patriarchal purposes. To state that, in contrast to other local forms of music, this repertoire is universal, and to assume that it is expressing the highest human ideals, is a claim that is not only both historically and methodologically fraud, but it can only be taken seriously from within a neo-colonial, elitist and patriarchal framework. Said’s approach to ‘music’, with its blunt ignorance of postcolonial theory and the resulting universalist claims, is exemplary for much of what today is categorised as ‘music history’. That these universalist claims continue to be made – not only by Said, but also in the study programmes in which we work and teach – demonstrates the persistence of the ideals of absolute, transcendental music and, related to that, the colonialist presumption of ‘western’ cultural superiority. I therefore argue that, regardless of how the different fields of specialisation are named, postcolonial theory should not be reserved for ethnomusicology, but it is just as urgent to include this critical perspective in historical musicology. Abels, Birgit (2014). ‘Musik, Macht und der Mythos Mehrstimmigkeit.’ In: Norient: Network for Local and Global Sounds and Media Culture (accessed on 27 July 2015). Ali, Tariq (2006). Conversations with Edward Said. London, New York and Calcutta: Seagull Books. Barenboim, Daniel and Edward Said (2002). Parallels and Paradoxes: Explorations in Music and Society. New York: Pantheon Books. Chakrabarty, Dipesh (2000). Provincializing Europe: Postcolonial Thought and Historical Difference. Princeton and Oxford: Princeton University Press. Dahlhaus, Carl (1989). The Idea of Absolute Music. Chicago and London: The University of Chicago Press. Glass, Charles (2004). ‘Edward Said: The Last Interview.’ See YouTube (from 23:39, accessed on 27 July 2015). Meer, Wim van der (2015). ‘I Buried Ethnomusicology.’ In: Cultural Musicology iZine (accessed on 27 July 2015). Nooshin, Laudan (2008). ‘Ethnomusicology, Alterity, and Disciplinary Identity; or “Do We Still Need an Ethno-?” “Do We Still Need an – ology?” ’ In: Henry Stobart (ed.). The New (Ethno)musicologies. Landam, Maryland (etc. ): The Scarecrow Press: 71-75. Said, Edward (1978). Orientalism. London and Henley: Routledge & Kegan Paul. Said, Edward (1991). Musical Elaborations. New York: Columbia University Press. Said, Edward (1993). Culture and Imperialism. London: Chatto and Windus. Said, Edward (1999a). ‘Farewell to Tahia.’ In Al-Ahram Weekly Online 450 (7-13 October) (accessed on 27 July 2015). Said, Edward (1999b). Out of Place: A Memoir. London: Granta Books. Said, Edward (2006). On Late Style: Music and Literature Against the Grain. New York: Pantheon Books. Said, Edward (2008). Music at the Limits. New York: Columbia University Press. Simon, Scott (2002). ‘Barenboim and Said: Parallels and Paradoxes’ (accessed on 27 July 2015). Young, Robert (1990). White Mythologies: Writing History and the West. London and New York: Routledge. Zeeman, Michaël (2003). ‘Interview with Edward Said.’ See Youtube (from 8:46, accessed on 27 July 2015). These thoughts were first presented in the joint workshop of the Music and Culture research group, UvA, and the Cultural Transformations group, Aarhus University, on 26 May 2015. For this occasion, I only concentrate on the specialisations Musicology and Ethnomusicology, and will leave Cognitive Musicology out of the discussion. Here I am only concerned with how the study programme is represented on this particular flyer. On the accompanying promotional website (www.musicstudies.nl), the geographical interests of musicology are specified as ‘European and North American art music traditions, jazz worldwide as well as past and present popular musics’ (see here, accessed on 27 July 2015). To my knowledge, Said has reflected on his early experience of listening to Umm Kulthum on three occasions in writing (Said 1991: 97-98; 1999a; and 1999b: 99), and several times in interviews (see e.g. Ali 2006: 40-41; Glass 2004 [from 23:39]; and Zeeman 2003 [from 8:46]). For a critical discussion of Said’s perception of Umm Kulthum, see Abels 2014.